Bill Sanders is one of the few American sports executives who have a uniquely deep and broad experience working with top Chinese athletes, sports brands and institutions. As the US marketing director of “Team Yao” – the team behind Yao Ming, Bill has played a pivotal role in making Yao Ming a global icon. As Chief Marketing Officer for BDA Sports, a leading global basketball agency, Bill has not only helped his top NBA clients land big endorsement deals with top global and American brands, but also with a few top Chinese brands. 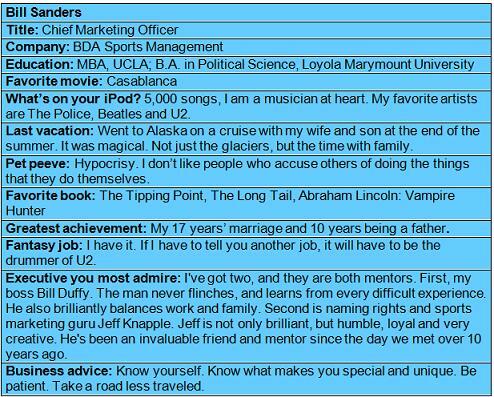 I was privileged to sit down with Bill at BDA Sports Marketing office in Santa Monica, California this August, and talked about his experience and insights about Yao Ming, China impression, Chinese sports marketing and etc. As Chief Marketing Officer for BDA Sports, Bill brings experience from the entertainment industry to help athletes project and maintain a polished image, which helps maximize endorsement opportunities. Bill believes the key to effective player marketing is the formulation of a long-term player/brand strategy, which includes a substantial commitment to community involvement, a proactive media relations plan and the pursuit of appropriate corporate partners. Bill and his staff are dedicated to the development of individual marketing strategies that highlight each player’s strengths, talents and interests. Bill earned his MBA, with an emphasis in Marketing, International Business and Entertainment Studies, at UCLA in 1998. He earned his Bachelor of Arts in Political Science from Loyola Marymount University in 1988. Bill also teaches Sports Marketing at LMU each fall semester. He resides in Pacific Palisades, California with his wife, Elizabeth and their son, Brendan. Besides being the CMO for BDA, Bill writes an influential sports business focused blog An Athlete Marketing Guy to encourage thought and discussion of current events and how they impact the world of sports marketing. Carrie Xu: Bill, at BDA you work with Yao Ming and you also work with a lot of other top American and international players. What were the key differences you had working with Yao vs. with the American top players? Bill Sanders: You know there is no one like Yao at all. And I don’t know there ever will be. He came along at a time when the world was focused on China’s economic growth and China was opening up and greatly changing their approach to the world at large. And I think Yao was able to represent New China, in terms of being an individual and accomplishing things as an individual, and yet still being respectful and dedicated to your group, your culture, your country, your family and your history. He represents both old and new (China) in my opinion. You know other countries have come through rapid economic growth and have seen a rapid rise in individualism at the expense of their dedication to the community, and Yao has been able to maintain both perfectly. So there is really no one else like him. We are lucky enough to have other clients that are also very, very active in the community and good citizens, and give back to those less fortunate. We have guys like Steve Nash, Baron Davis – these are wonderful people. But I think Yao is unique in that he came from China at the very moment that China was emerging on the world stage. And his role in the Beijing Olympics and this almost ten year period during which Yao’s career lasted was arguably the fastest growing period in China’s modern history in terms of their economy and their role as a player in the world community. So I think Yao came along at the exact moment in history that enabled him to represent something really special. And so it is hard to ever compare him to another player. Carrie Xu: Looking back, in 2002, when Yao Ming first arrived at NBA, at the very beginning many people were skeptical about whether Yao would be successful, but very soon Yao became the super star. From the athlete branding perspective and as part of the Yao Team, what you see were the key elements that led to Yao’s huge success? Bill Sanders: It’s a good question. There are two things that lead to an athlete’s success as a marketing icon. The first is on the court. They have to perform on the court. They have to be really exceptionally talented. They have to achieve some amount of success. 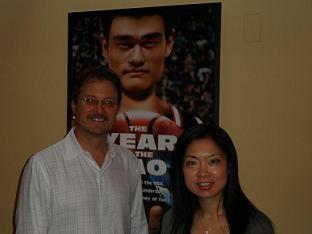 Yao won a championship with the Sharks. He came over here establishing himself very quickly as one of the best players in the NBA. That has to happen for a player to emerge beyond sports. But the other piece is their off the court persona, which is made up of their personality and integrity. Yao is really, really a smart, funny, charming, good person. And those things all became apparent very, very quickly. There were skeptics here in the U.S. that didn’t think as a tall Chinese-speaking person that he would be a star here, but people soon focused less on his height and his country origin and started to focus on him as a person. He was really funny, and really charming. And people fell in love with him because of who he is as a person. Suddenly his being tall and being Chinese became very secondary to the conversation. As still to this day, if I run to someone and they ask me what I do for a living, I say I’m involved in Yao’s marketing and people’s marketing. I always hear how much they love Yao’s commercials, how much they loved every time Yao was on TV they enjoyed seeing him, because he was always funny and always charming. So I think Yao broke through because of his tremendous talent, but because also who he is as a person. Carrie Xu: On July 20th, when you wrote the touching blog article Xie Xie Yao Ming, Yao announced retirement from basketball. Although it is such a pity, I wish Yao Ming all the best in his new journey. And would you mind sharing in what kind of areas will you and BDA continue to work with Yao Ming? Bill Sanders: Well, we know in our business our clients don’t have very long playing careers. If you are lucky in the NBA, you can play ten years, or maybe a little bit more. So Yao’s career seems very short, but actually it is not that unusual for an NBA player to play five, six, seven years. It’s not that unusual at all, unfortunately. So we try to help them begin to think as soon as possible about what kind of career they want after they are done playing basketball. And we see part of our responsibility helping them transition. For some guys, it means they want to get into coaching, or they want to work in the business of basketball. For some guys, they want be a broadcaster, working on the camera as a sports commentator. And for some guys, they want be in business. So we try to help them with those transitions as early as in their career as possible. And so in Yao’s case as is in the case with a lot of our clients who are super star icons, once they are established on the court, we really start working on close career opportunities. And it became clear to us that Yao wanted to be a business person, and also wanted to be a philanthropist. So we encouraged him to get involved in charity work and also in business work. I can’t deliver too many of the details of the things we are working on at the moment, because the announcements are coming soon. But if you look at what we have done with Monster Cable company, there is a whole line of Yao Ming electronics products, head phones, speaker cables, power cables, things like that. I think you will see more things like that. 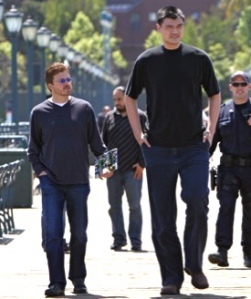 Yao, instead of being paid as a spokesperson, is actually an active participant in the business. He also has a team on the ground in China that we work closely with, but we are not involved day-to-day in his China only business. But I am aware of the things that are going on there. It’s same kind of stuff. I think Yao is going to remain very visible. Here in the U.S., the closest example that we normally think of is Magic Johnson, whose after career became very involved in local community, became very involved in business, and is a very successful business person today. He was able to use his basketball platform to define the rest of his life. I would see Yao evolve along the same line (as Magic Johnson). I think he’s gonna be around for a very long time. This is why when I wrote the blog, I was really sad that I wouldn’t see him play in the Rockets uniform anymore, and sad he doesn’t live in the U.S. anymore, because I won’t see him as much. But I know that actually the things that we are working on with him now, I am more excited about them than almost anything we’ve ever done. I am especially excited about some of the things we are working on over the next 12 months.